We are the northern most kennel established November 3, 2012 of the internationally known Hash House Harriers or the "Drinking club with a running problem." We can trace are roots all the way back to the first kennel- Kuala Lumpur Hash House Harriers in 1938. Today, there are thousands of Hash House Harrier groups. We are runners, but without a great emphasis on speed. "Mismanagement" helps to organize or doesn't the upcoming trails and events. A typical trail: We meet at various locations, the "hare" will lay a trail with chalk or flour that the "hounds" will follow in order to find the beer of course. There are various checkpoints in which the trail can go in any direction. This is designed to allow the faster harriers to get a little extra exercise and for those of us who are a little slower to catch up with the goal for the pack to finish close together. We then "circle up" in order to reward and punish great feats alike with a rugby type song and a spot of ​brew. President. This person runs the Circle at the end of the Hash. The person is responsible for calling mismanagement meetings when needed and staying informed with all other mismanagement positions. This person usually is a seasoned person with the Aurora Hash (in the past, the one with the most Aurora Hashes and wants to serve as GM). This person can make any rules and/or traditions with regards to the Hash. Secretary. The person or people take notes at mismanagement meetings. They also do a write up of the Hash each week (any form and length they want) and pass it along to the e-mail person. If a weekly newsletter is passed out at the Hash, hopefully the upcoming Hare has passed on information and directions which can be included. She also holds the position of Hash Flash and takes pictures on trail. Hash bar. This person or people buys beer/alcohol for each week at the Hash. With HooDoo and Silver Gulch there are often local and imports available. Bottled beer is dangerous and extra weight, so is not needed. This person gets reimbursed from the Hash Cash. Secretary. The person or people take notes at mismanagement meetings. Also this person or people keep the website updated. It should have the information on the next Hash hopefully A WEEK before the Hash. 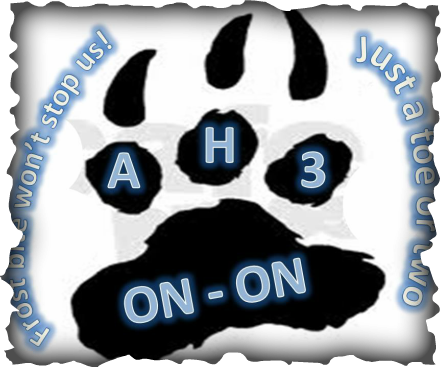 The website contains pictures and information about other Hashes and events that are going outside Fairbanks. Songs are also on the website for people to learn and sing at the Hash. Hash store. This person or people are in charge of getting items the Hash or mismanagement has approved to purchase, such as shirts, shorts, stickers, etc. They can either buy the items themselves and get reimbursed by Hash Cash or get the Hash Cash to pay for it, once they have done the artwork, found a vendor, etc. Haberdashery items should be brought each week to the Hash so they can be sold to visitors, virgins, and Hashers. It is also good if they go, or find someone who is going, to events out of Fairbanks to take the items to sell. Haberdashery is usually a good means to make some money for the Hash. This person is in charge of getting a Hare. If no Hare is found, the person must buy flour to do a lottery Hash or set Trail on their own. That is it. Note: It is the Hare's responsibility to determine the proper location and give good directions to the Start and the PRE-DETERMINED ON AFTER. Should have a song available when asked by the GM or RA. Teaches songs to new hashers, forces the old to remember songs. He/she takes pictures of the event and post them for prosperity and helps to create the Hash Trash.